Could you guess what was the first name of Mexico city? The teacher Homar told me about it and gave a lot of other interesting information during our class on engoo.com. When Spanish came to Mexico 200 years ego they named the city New Spain. The city was set on the huge lake. Mexico city has many touristic sightseeings. There are museums, art buildings, government offices, parks in Mexico city. 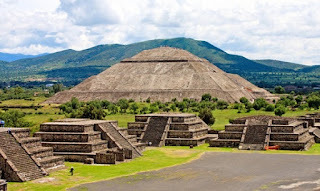 One of the greatest ancient places is located near capital city Mexico city. 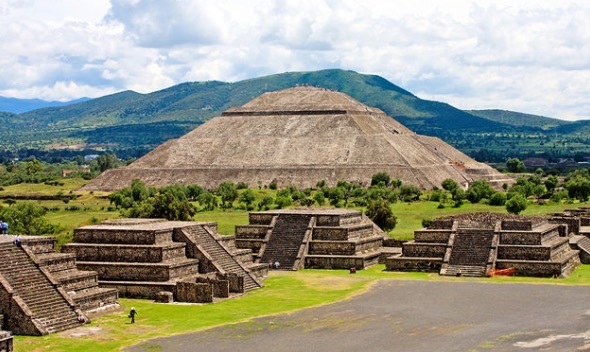 Teotihuacan is a vast Mexican archaeological complex. This site represented the civilization of Aztecs during the pre-Columbian era. Tourists can walk down to the Avenue of the Dead and look to the Temple of Questzalcoari, the Pyramid of the Moon and the Pyramid of the Sun. The teacher recommended me as a tourist's sightseeing the Plaza de la constitution. But this place has a different name in Wikipedia. The Zócalo is the common name of the main square in central Mexico City. Prior to the colonial period, it was the main ceremonial center theAztec city of Tenochtitlan. The plaza used to be known simply as the "Main Square" or "Arms Square," and today its formal name is Plaza de la Constitución (Constitution Square). However, it is almost always called the Zócalo today. Monumento a la Independencia or in English the Angel of Independence is a victory column. The Plaza de las Tres Culturas ("Square of the Three Cultures") was named in recognition of the three periods of Mexican history reflected by buildings in the plaza: pre-Columbian, Spanish colonial, and the independent nation. Guadalajara is a city in western Mexico. It's known for tequila and mariachi music. If you are dreaming of visiting the intriguing Maya ruins, you need to visit the Yucatán Peninsula which is located in southeastern Mexico, separates the Caribbean Sea from the Gulf of Mexico, with the northern coastline on the Yucatán Channel. 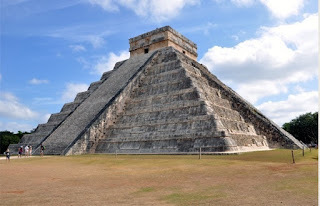 Chichén Itzá is the most famous Maya ruin and a UNESCO World Heritage Site. Cancún, a Mexican city on the Caribbean Sea, is known for its beaches, numerous resorts and nightlife. Merida is the capital and largest city in Yucatan state and the cultural and financial capital of the region. Oaxaca (pronounced wa-hah-kah), a city located about 300 miles south of Mexico City. Rich in history and culture, Oaxaca is a fascinating destination where tourists can appreciate ancient civilizations, colonial art, and architecture and vibrant cultural traditions. Let's agree with the fact that the tourists who like exploring the history of civilizations need to include in their top list of the most attractive distinctions this fabulous country - Mexico.